Northeastern Chimney employs CSIA trained & certified chimney sweeps to provide chimney sweep services like chimney repair, chimney cleaning, chimney inspections, chimney relining, chimney restoration, and more. Are you looking for a certified chimney contractor in the New Britain CT area? Look no further than Northeastern Chimney. We ensure that every job we complete is done to the highest quality and according to strict industry standards. From New Britain CT to Kensington CT, Berlin CT, Farmington CT, West Hartford CT, Windsor CT, Granby CT, Bristol CT, and all of Hartford County, we have been serving residents for 30 years. Our amazing reputation with the local residents is a result of many years of consistently delivering the very best customer service and work to every homeowner we serve. There's a reason we've earned an A+ rating for chimney sweep service in New Britain, our our dependable service and high quality work is just the beginning. Throughout the historic town of New Britain CT, Kensington CT, Berlin CT, and across Connecticut Rt 9 and I-84 & I-91, residents will easily recognize our brightly-marked company vehicles as our chimney sweep crew travels on their way to deliver top-notch chimney sweep services. All across Hartford County, NEC has become the chimney contractor of choice for services like chimney inspections, chimney repairs, chimney maintenance, chimney crown rebuilding, masonry repair, chimney waterproofing, furnace flue cleaning, and more. Our high standards & top-of-the-line workmanship has helped us garner many repeat customers over our 3 decades of service. You can count on our professional and friendly chimney technicians to arrive on time, in a marked company vehicle, and in uniform. Our company is fully insured and we always stand behind the services we provide to ensure every homeowner is 100% satisfied. 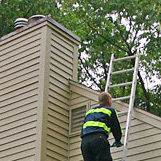 Serving the town of New Britain, Hartford County, and the surrounding area, our chimney techs are all CSIA certified & trained which means we will always provide homeowners with a written & fair estimate. We will also gladly explain in depth any services we recommend and why. 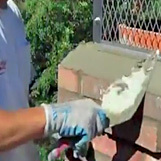 Always take precautions when hiring a chimney contractor. The chimney sweep industry contains some unscrupulous “chimney sweeps” that are out to scam homeowners. They offer prices that are too good to be true in hopes of being hired. Once at the home, they perform a cursory inspection or cleaning. Many of these scammers are neither certified nor trained. They perform a “quickie” job so they can get to what they are really there for - upselling the homeowner. These fake chimney sweeps know that most homeowners are unaware of the current condition of their chimney system. They use this to their advantage and try to scare the homeowner into thinking that they need immediate and expensive chimney repair services. Never agree to costly or extensive repairs without contacting a reputable chimney sweep first! Choose the pros at Northeastern Chimney for your fireplace, insert, stove, chimney & venting needs. Best Rated Chimney Sweep Contractor in the New Britain CT area offering the quality chimney services you deserve. Jan 24, 2017 by Barbara R.
chimney sweep Chimney company rebuilds chimneys, chimney cleaning, chimney repair by certified techs.